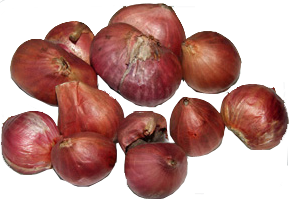 Asian shallots are small reddish-purple onion, that grow like garlic bulbs. They have a strong, intense flavor. For usage you usually cut or grind it. If not available, you can use French shallots as a substitute. 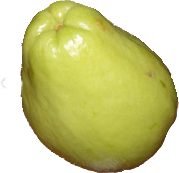 The chayote (Sechium edule) is a climbing plant of the subtropics and tropics, whose edible fruits are also known as chayote and are cultivated as vegetables. It comes from the gourd family. If not available, you can use cabbage as a substitute. Aleurites moluccana, kemiri. Candlenut shell is really hard & the kernels are extracted before being sold. Raw candlenut is mildly toxic & should not be eaten but after cooked they become harmless. If not available, you can use macadamia as a subtitute. 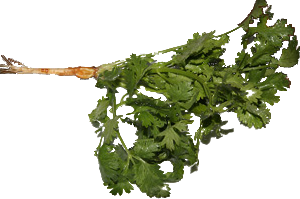 Coriander leaves are also known as Chinese parsley. 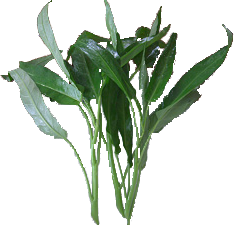 The leaves impart a peppery taste and are often used as a garnish. In Indonesia kitchen this leaves are rarely used. 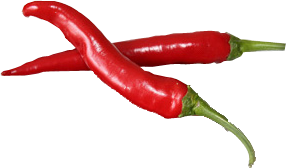 Large red chillies are are a long and thick, ripening cultivar of chillis. These chillies are often used in Indonesian cuisine, especially from Minangkabau people. 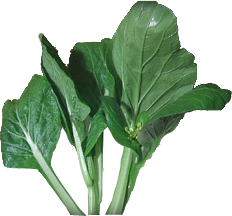 Choy Sum is also known as Chinese flowering cabbage. It has soft green leaves and yellow flowers at the tips of the inner impulses. For use they are usually cooked briefly. In the kitchen, they can be replaced with Bok Choy. Egg noodles are light yellow colored pasta, made from wheat, flour and eggs. For usage they are cooked shortly in hot water, until they become soft. Salam leaf (Eugenia polyantha) is an Indonesian bay leaf. Daun salam is known only in the Indonesian and Malaysian cuisine and has absolutely nothing in common with the Indian bay leaves, which are often mentioned in books on North Indian cuisine. While Salam leaves are rarely traded in Europe, ordinary bay leaves are usually recommended as a subtitute , although there is not much similarity between them. 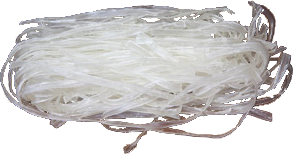 Glass noodles are hard and transparent noodles. For usage they are cooked shortly in hot water. 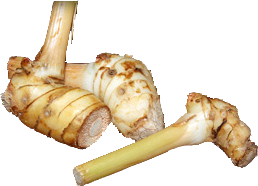 Galangal, also known in Indonesia as Laos or Lengkuas, is a pink-colored root, which gives a peppery flavor. If possible use fresh, to get the best possible taste. 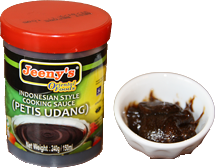 Kecap manis is a thick, dark sauce and is also known as a sweet soy sauce. Ketjap Manis has a sweet, malts, spicy flavor and is essential for the authentic Indonesian cuisine. 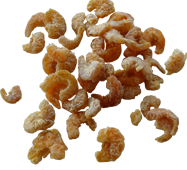 Dried shrimp paste, also known as terasi, consists of dried, salted and crushed shrimp. This ingredient is used in Indonesian cuisine often. It needs to be heated ( rosted or fried ) before use. Warning: This paste is not suitable for the Western cuisine, because it has a pungent odor. Keluak also called Keluwek, Keluwak, Kluwak or Kluak called, is the fruit of the Pangi or Kepayang tree (Pangium edule Reinw., Family Achariaceae), which is native to Southeast Asia. Keluwak is primarily used in in Central and East Java as a spice for Rawon, a black beef soup. In the West keluak is usually sold in block form. 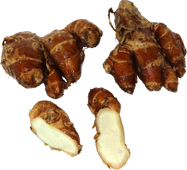 Turmeric is a yellow-pink root, which is valued for its yellow color. Turmeric is often used in curry dishes. If possible, use fresh, to get the best taste. Lesser Galangale (Alpinia officinarum) is a highly aromatic, spicy, almost medicinal root. Small galanga is a close relative of galanga, but the two have very different flavors and tastes. Because the fresh roots in the West are rarely traded, is most often used as a dried rhizome or powder. Large, green chillies are long and thick, unripe fruits. 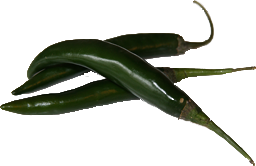 These chillies are often used in Indonesian cuisine, especially for green curries. 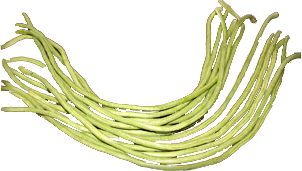 The delicate snake-beans, also called long-beans, are known to be around 80 - 90 cm long. In Indonesian cuisine, they are used raw for salads, stir-fried, boiled or steamed as a vegetable side dish. Yard Long Beans should be cooked only briefly, otherwise they lose their crunchy bite. Lime is a citrus fruit, containing a very acidity and aromatic fruitjuice. Coconut milk is a liquid that is gained from the flesh of fresh coconuts. 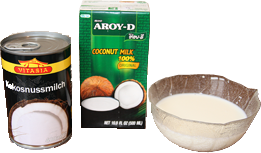 Coconut milk is often used in Indonesian cuisine. In Indonesia it is usually made from fresh grated coconut. Thus one can gain a very rich texture. Fresh Coconuts are rarely traded in Western countries, hence the finished product is often used as an alternative. Since the preparation of roasted peanuts is very elaborate, Pinda Kaas, which is a Dutch peanut butter, is often used as a substitute. Other varieties of peanut butter can also be used, but they are quite far away from the flavor of the original. 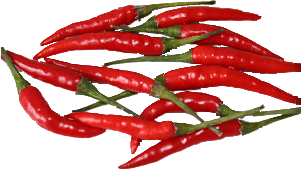 Small red chilies are small, ripe fruit that are very spicy. These chilies are often used in Indonesian cuisine, especially for spicy dishes. Palm sugar is a type of sugar that is extracted from the boiled sap of palm trees. It is usually sold in block form or powder. If not available, you can use brown sugar as a substitute. Lemon grass is a long grass with lemon flavor. From the grass only the white inner part is used. You can soften the entire stemm by pounding it with a pestle or handle of knife. 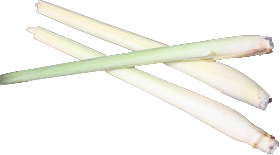 Lemon grass is often used for Curry dishes. It is best to use fresh lemon grass, because the dried lemon grass is pretty tasteless. The tamarind is a tropical fruit with a fibrous pulp. We distinguish between the sweet and the sour tamarind. For the Indonesian cuisine the sour tamarind is important. You get the black fruit puree pressed as a block. Oyster sauce is a thick dark sauce, consisting of a mixture of oyster extract, soy sauce, salt, garlic and onions. Oyster sauce is characterized by a salty, slightly fishy aroma. The shrimp paste has an extremely spicy flavor and a pungent odor that many non-Asians feel to be repulsive. The shrimp paste is actually an essential ingredient in many Indonesian dishes, but it can (should) be omitted from Europeans. Ipomoea aquatica is a semi-aquatic tropical plant grown as a leaf vegetable. It is known in English as water spinach, swamp cabbage, water convolvulus or water morning-glory, and has many other names in other languages. It is found throughout the tropical and subtropical regions of the world; it is not known exactly where it originated. The vegetable is a common ingredient in Southeast Asian dishes. 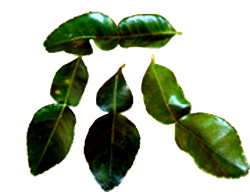 Kaffir Lime Leaf is the leaf of Citrus hystrix. Though the peel & the juice of the fruit are used in cooking, but mostly Indonesian recipes use the leaf only. 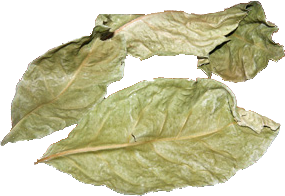 This distinctively "double" shaped leaf provides an aromatic, astringent flavor. You can use either fresh or dried leaves. Fresh leaves can be stored frozen. Both are available in most Oriental / Asian shops.